Jenny McNabb and her family travel west in a covered wagon in 1867 in Eagle Talons, The Iron Horse Chronicles–Book One. Will Braddock first encounters Jenny when the family’s Conestoga wagon breaks a wheel when crossing a swollen creek near Julesburg, Colorado. 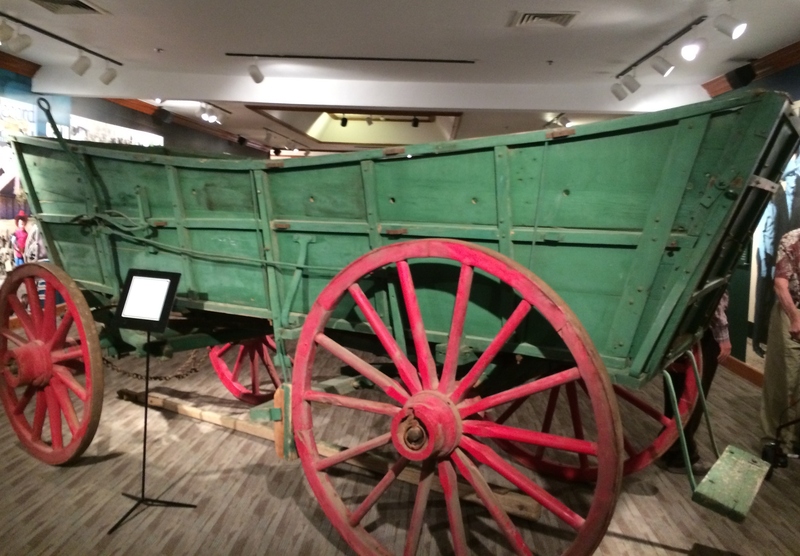 The Conestoga wagon was generally considered too heavy for travel in the roadless west. This heavy vehicle had been developed for hauling freight on the roads of the eastern states. There are, however, many instances of it being used for the migration to California and Oregon. One such is a Conestoga wagon that was abandoned by the Donner Party in their failed attempt to cross the Sierra Nevada Mountains in the winter of 1846-7. This restored Conestoga wagon is on display in the National Ranching Heritage Center in Lubbock, Texas. Because of its size, the Conestoga could haul up to six tons. Its ends were curved upward to keep the cargo from shifting. This wagon is missing the typical canvas cover that would be stretched over a series of wooden hoops. The brackets for supporting these hoops are visible along the side of the wagon. The McNabbs might have been more successful in their attempt to cross the flooded creek that fed into the South Platte River if they had used a plain farm wagon. Their cargo capacity would have dropped to 1.5 tons. Regardless of which wagon the pioneers used, the covered wagon earned the nickname “prairie schooner” because at a distance their canvas covers resembled the sails of a ship. That canvas would probably have been coated with linseed oil to weatherproof it and provide protection for the cargo. The wooden bed of the wagon would have been caulked with tar to enable it to be floated across rivers. Some travelers used teams of horses or mules, which provided more speed than oxen, but horses and mules required grain to keep them healthy. Oxen, although considerably slower, could survive by grazing on local grasses. 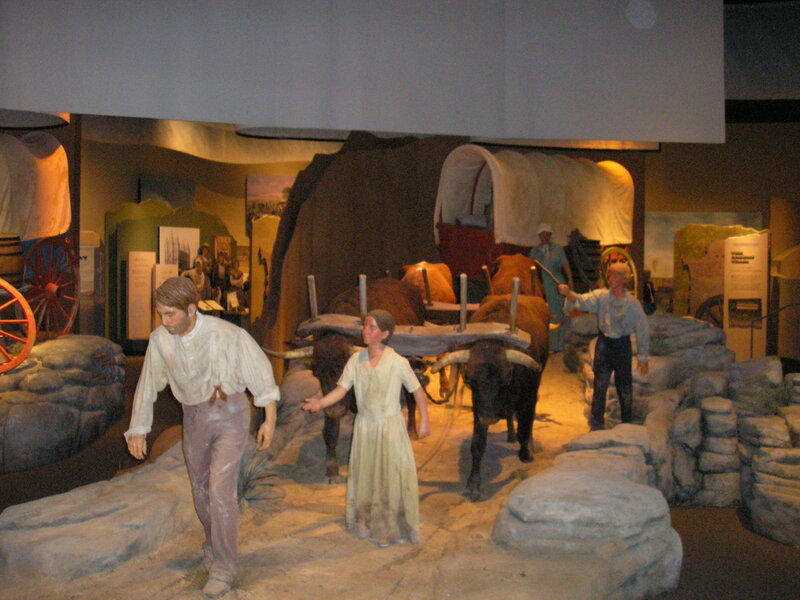 The National Historic Trails Interpretive Center in Caspar, Wyoming, greets the visitor with this scene of a family heading west with their wagon pulled by four oxen. This family walking beside their team and wagon reminds me of the McNabbs. Riding in the wagon was seldom done. It is almost impossible for us today to imagine walking the 2,000 miles for the five-month-long journey to reach a new home in the far west. This entry was posted in Animals, Eagle Talons - Book One, Geography, Iron Horse Chronicles' Characters, Museums and Parks, The Iron Horse Chronicles, Trails, Wagon Trains and tagged Adventure Fiction, Eagle Talons, Frontier Fiction, Historical Fiction, Historical Parks, Horses, Jenny McNabb, Middle Grade Fiction, Museums, Pioneer Life, Teen Fiction, The Iron Horse Chronicles, Western Fiction, Westward Expansion (1867-1869), Will Braddock, Young Readers. Bookmark the permalink. Loved my visit to the NHRC. The conestoga wagon may have been my favorite display piece inside.